I had the amazing opportunity to try out this product. I have used other creams in the past from many different places, my skin is very sensitive. It's hard to find something that can and will suit me. When I was asked to review this it was a must for me. I also like sharing new products. While I did receive this product free I will always give my honest opinion. I found that it did make my eyes feel less drowned out, it honestly felt very good and it didn't burn my skin or cause irritation like other products have in the past. My eye area each time after application felt silky smooth and the next morning. My only problem is that I didn't see any improvements with wrinkles. I would suggest this to anyone with dark circles. It worked amazing on my very sensitive skin. It would make a great gift. ★LUXURIOUS FEEL - It contains a combination of Organic Aloe, Alpha Lipoic and Alpha Hydroxy acids which work by removing old skin, allowing new skin to be produced. The Eye Cream is soft and creamy and feels soothing when you put it on. In fact, some have described the feeling as luxurious. It is not greasy. Formulated for Quick Absorption. 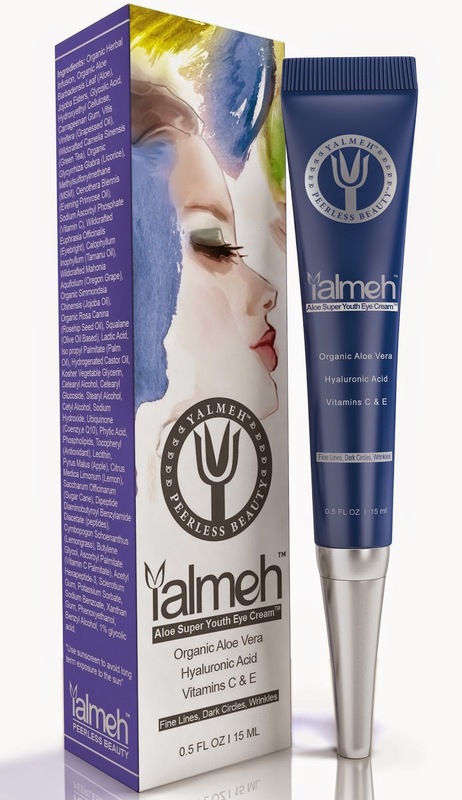 ★ALL NATURAL INGREDIENTS- Yalmeh Eye Cream contains all natural ingredients, no toxic chemicals or cancer causing additives - no mineral oil, propylene glycol or paraben. We do not test our products on animals NEVER-EVER. The Aloe Vera based eye cream contains organic and natural oils, gels and extracts, as well as Grapeseed Oil and Vitamins E and C, and is an effective natural solution for all types of skin. And, it lasts forever - a little goes a long way. And what matters most, however, is that the cream works incredibly well. You will feel better both inside and out. ★REDUCE FINE LINES - Watch the fine lines in the corners of your eyes be reduced to the point that they are no longer visible. With Yalmeh Super Youth Eye Cream, you will see the difference in the morning. Your skin will look younger, feel softer and the areas under your eyes will look lighter. People who have used it around their mouth, forehead and cheek areas, have seen similar results in those areas. Our customers normally see results after three months of daily use, although some see improvements much sooner. Our products are Made in the U.S.A. in our Advanced FDA Registered facility. Everyone that uses our products, come back for more. We must be doing something right!